CANTON, Mass. 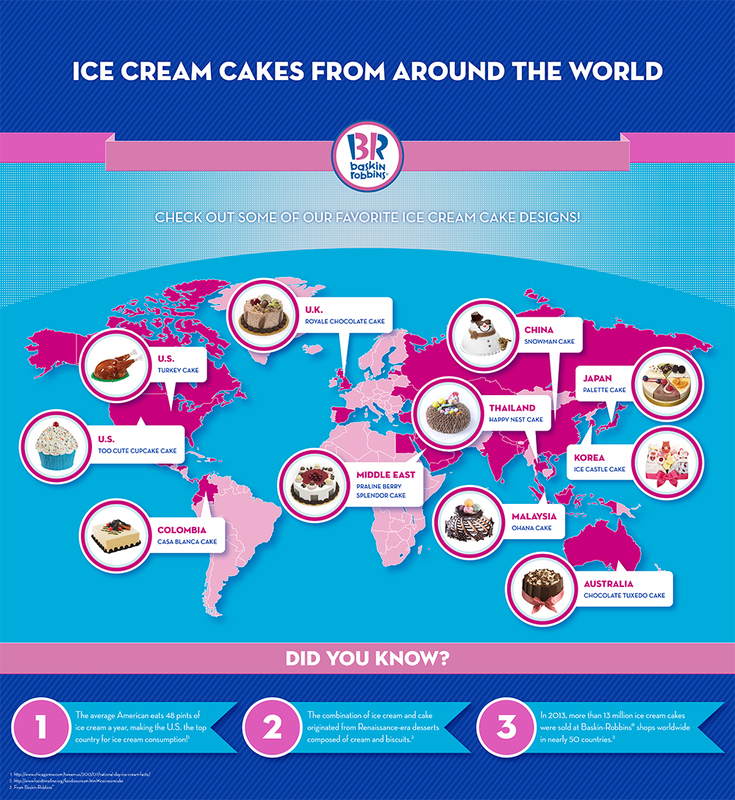 (October 1, 2014) – Baskin-Robbins, the world’s largest chain of ice cream specialty shops, today announced a Global Ice Cream Cake Celebration with giveaways and new cake options for its guests. Beginning today and running through the month of October, Baskin-Robbins will be giving away “31 Cakes in 31 Days” in countries around the world, from the United States and Japan to Australia and the United Kingdom. In addition, the brand is rolling out two new ice cream cake options at participating U.S. locations, the Celebration Mini Roll Cake and Rosette Mini Roll Cake. As part of Baskin-Robbins’ ice cream cake celebration in the U.S., the brand is inviting followers of @BaskinRobbins on Twitter to share how they celebrate life’s occasions with ice cream cakes for the chance to win a Baskin-Robbins gift card to use towards a cake. 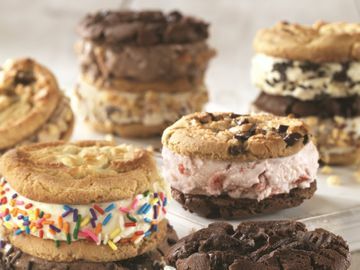 For its Ice Cream Cake Celebration Twitter Sweepstakes, the brand will give away one $31 Baskin-Robbins gift card each day throughout the month of October to help celebrate the joy that ice cream cakes bring to people around the world. No purchase necessary, must be 18+ to enter. Void where prohibited. For official rules and additional information related to the Ice Cream Cake Celebration Twitter Sweepstakes, visit the following link. The Celebration Mini Roll Cake and Rosette Mini Roll Cake start at the suggested retail price of $12.99 at participating Baskin-Robbins shops across the country. The new Mini Roll Cakes serve 2-4 people and are perfect for sharing at small gatherings with friends and family. In addition, the brand is offering seasonal ice cream cake favorites, including the Pumpkin Patch Cake and Fall Harvest Roll Cake, which are customizable with a guest’s favorite ice cream and cake flavor combination, including the October Flavor of the Month, Trick OREO® Treat, which features vanilla-flavored ice cream with orange crème-filled OREO® cookie pieces, Baby Ruth® and Butterfinger® candy pieces. These designs, as well as many others, are available to order through Baskin-Robbins’ online cake ordering website at www.baskinrobbins.com/onlineordering. 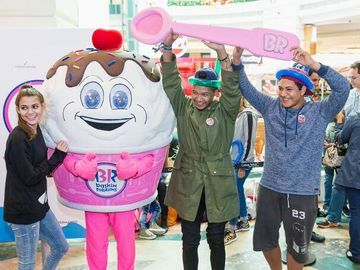 Today also marks the kick-off of The Dunkin’ Donuts & Baskin-Robbins Community Foundation’s (DDBRCF) “Cakes for a Cause” Program, in which guests are invited to make a $1 donation to the DDBRCF at participating Baskin-Robbins restaurants nationwide. In appreciation, guests will receive a paper icon featuring an ice cream cake to sign and display at their local restaurant. All funds raised will support The DDBRCF’s efforts to serve local communities by taking care of their basic needs: hunger, children’s health and safety. Launched in 2006, The DDBRCF has granted more than $4.6 million to local charities. OREO® and the OREO® Wafer Design are registered trademarks of Mondelēz International group, used under license.